The book sounds super cool. I will check it out on Amazon. Thanks. Definitely agree with you on this one. I wonder if its statistically accurate, or if it just feels like Utah has a higher percentage of writers than is typical. I've seen this book around and thought it looked interesting. Yes, who needs ANOTHER Hunger Games, like who needs another Twilight? I like stuff that's FRESH! Also love your "face-bomb," BTW! I think the great writers have a certain confidence ... and it definitely took confidence for Dan Wells to tell this publisher he wasn't going to give them what they wanted. LOL! 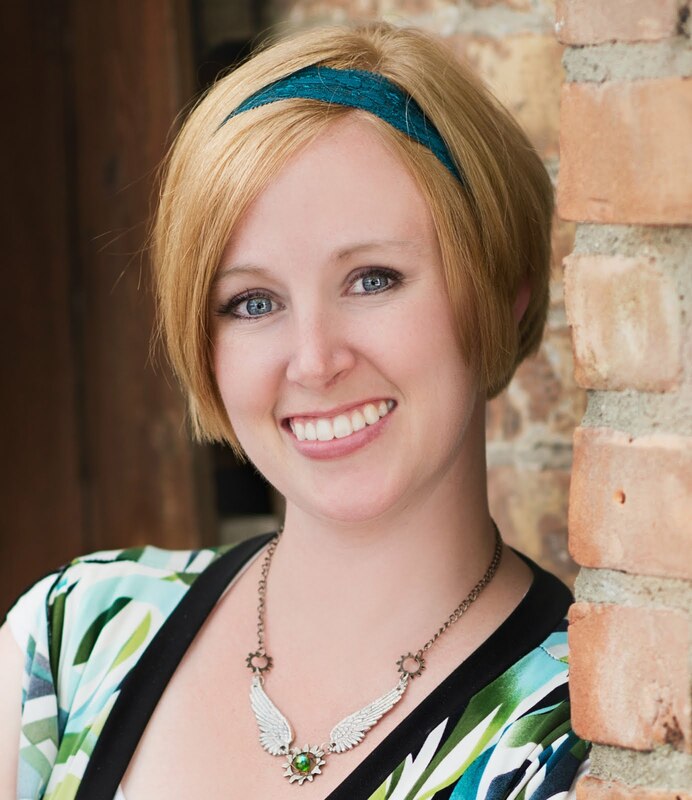 I think, as aspiring writers, one of our biggest challenges is learning when to be confident. We have so much to learn at the beginning and we feel so confident at first, then have all that confidence torn away and have to rediscover it again when we're better writers. I admire seasoned authors who are able to try something new and make it succeed. I am so going to read this. I NEED something outside my genre right now! The book looks awesome! I saw it at B&N the other day actually and it's been making the rounds on several blogs. I'll have to add it to my to-read list. Thanks for the mention! The book signing was so fun, and I have to say I VERY MUCH agree with your review of this book. It was exactly what I needed. Love love love! Oh my, it sounds AMAZING! there are so many things that I want to read right now... it's crazy, I wish I had time to go to every author signing and get all of their books and read them all! Author signings/book launches are so fun! And this sounds like an intriguing read. I love the book cover. Dan looks like he's having a great time at his signing. What a fun for you both! Glad to see he didn't disappoint! Can't wait to read it. "I've already read that book..." I love that! Kudos to him. And I love that picture of you. You look so happy. You're so right, fresh brings smiles. I'm going to check Dan's book out. And Teralyn's right - you look so happy. Sounds like a great book. I also love the cover. Awesome! Sounds like you had a great time at the signing. And the book sounds amazing! I was really impressed by Mr. Wells at LTUE. I really enjoyed Cherry Heaven by L. J. Adlington. It's highly futuristic and takes on some of the typical aspects of that kind of fiction, but the plot/characters really stood out, I thought. I enjoy dystopia. I just added this to my wish list. I love living near fabulous authors. I get to go to many book signings. i am so jealous of you utes! its like the silicon vlley of writng! going to check out this Partial! I loved I AM NOT A SERIAL KILLER. SO much! I got to get his new one. I'd like to be commissioned one day! Glad you got to meet him and get an autographed copy! Last really great book I read was Lies of Locke Lamora. This sounds fantastic. Can't wait to read it. Thanks so much for the review. Jealous that you have this read already. I need to get my act together and order this novel. Thanks for the review! You got me so excited to read it! I think Dan is incredible. And I hope that someday (if I ever got the chance), I'll have as much guts as Dan if a publisher contacted my agent and said, We will pay Peggy to write this book to say, Nope! But I will write THIS. First, I LOVE the facebomb! It looks like you had a great time! Second, I'm definitely going to get this book. Thanks for the recommendation! 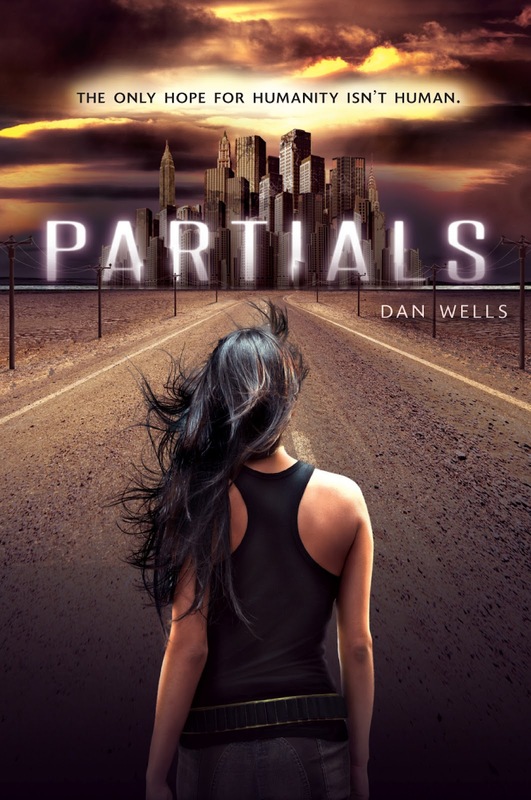 Partials by Dan Wells is unique and riveting, I strongly encourage any Young Adult Dystopia fan to read this one. Maybe I am head over heels for this one because I didn't have high expectations. Thank goodness I ignored some of the remarks I'd heard, because I walked away from this novel completely entertained. I enjoyed every second of it and had a hard time putting it down. Samm, a character we (unfortunately) do not get to meet right away, has me smitten. I adore him. He really kept my head in the story. There were other characters that I wanted to connect with, but I just couldn't do it. The plot had me intrigued- I find the humans vs. partials story fascinating. The best part is that there is a little surprise at the end, and I love it. Love a good little twist. Speaking of twist- what a world! 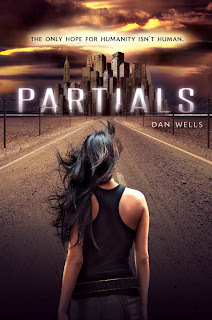 Dan Wells really did a superb job vividly describing his world in Partials. I could see everything.